Prague, the capital of the Czech Republic, is the country’s natural political and cultural centre, a major business hub and a UNESCO’s World Heritage city with a historical core that attracts several million tourists every year. With 1.2 million residents living in Prague already, the city in the heart of Europe attracts a rising number of newcomers who move here to live, study or work. Chcete-li se dozvědět více o akcích Shared Cities: Creative Momentum v Praze, pokračujte prosím na webové stránky našich partnerských organizací Goethe-Institut, Česká centra nebo reSITE. With an increasing number of inhabitants and new visitors, more attention has been focused on new residential development, civic investment, infrastructure and public participation in urban planning, marking a new era of urbanity for the city. When looking for efficient and creative solutions to Prague’s challenges, sharing is seen as one key to expand cultural and economic opportunities. In today’s Prague, we are witnessing a revival of the sharing of products, services and even lifestyles. The principles and efficiency of the sharing economy – especially when it comes to flats, offices, bikes and cars – have started to find their way into the life of citizens in the mid-sized Central European capital after all. The Goethe-Institut is the Project Lead of Shared Cities: Creative Momentum. Besides promoting the study of German, the Goethe-Institut encourages international cultural exchanges by organising programmes of events and contributing to various festivals and exhibitions across the globe. With a network of institutes, cultural societies, reading rooms and exam and language learning centres, Germany’s cultural institute has played a central role in the cultural and educational policies of Germany for over 60 years. As the Goethe-Institut has 159 centres worldwide, the exchange of ideas, the transfer of knowledge and the sharing of good practices between cities is why it was drawn to Shared Cities: Creative Momentum in the first place. reSITE is the Curatorial Lead of Shared Cities: Creative Momentum. reSITE is dedicated to creating livable and lovable cities, by understanding the intersection of design, policy, culture and the new economy in a continually urbanizing world. Since the founding in late 2011, reSITE has established itself as an international thought-leader for sustainable urban solutions; a change maker for urbanism in Central and Eastern Europe (CEE); and a tireless advocate for bridging the gap between politicians, investors, designers and the public. reSITE wants to utilize the efficiency of the collaborative economy and explore the lifestyle, benefits and risks of sharing. As a group of architects reSITE aims to create better public spaces so that the city is a more inclusive and shared place to live. 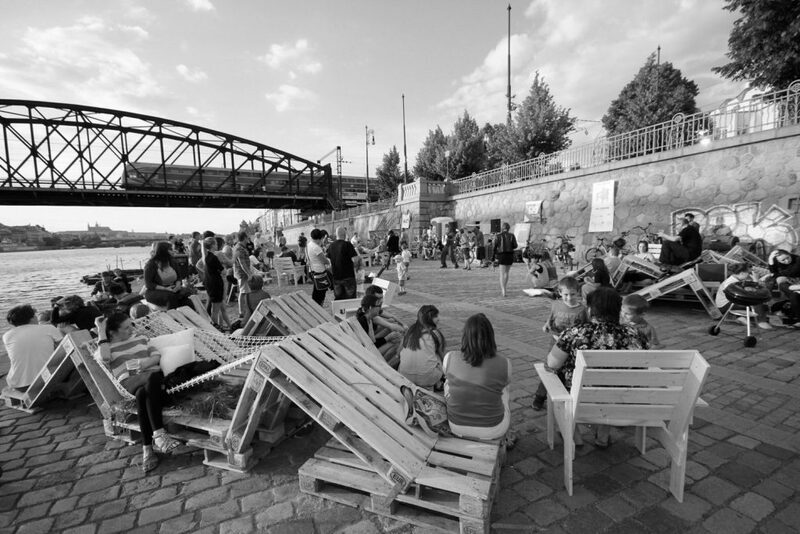 You can get connected with reSITE in various ways, from getting inspired by reSITE Small Talks to getting involved in reSITE’s events such as the premier annual architecture and urbanism event that takes place annually in June in Prague. The reSITE team would also like to invite you to Manifesto Market, a pop-up space in the centre of Prague. The Czech Centres is a contributory organisation of the Ministry of Foreign Affairs of the Czech Republic. It is established to promote the Czech Republic’s history, culture, language, tourism and trade abroad. Considered an active instrument of foreign policy of the Czech Republic, the network consists of centres in over twenty countries throughout three continents. The Czech Centres participates in Shared Cities: Creative Momentum to engage with and promote the discussion of urban development in cities throughout Central and Eastern Europe; to create links and share knowledge for the promotion of better living in these cities and to help build inclusive decision making processes within urban development. You can also visit Czech Centres Gallery in Prague, where we feature exhibitions, collaborations and works from a variety of Czech and international artists. 15|09–13|10|2018, PRAGUE: How does migration change the cities? How does it manifest in architecture, housing, services and public space ordering? What happens with the urban space when newly arriving inhabitants from all around the world start to make use of it?